So as many of you have read I’ve been feeling quite overwhelmed and low recently. So I decided to write a more upbeat blog post today. Kids do and say the funniest things, so I have been thinking about what my kids have done in the last week or 2 that made me smile! Coming in at number 5…. BG walking into the mirror! Yes into the mirror. She was looking at her self and admiring her self. She was brushing her hair and flicking her hair all over the place and then bam straight into our mirror. Picture the scene, MO was laying on the sofa watching Baby TV (90% of the time he watches this channel, which is absolutely fine, I’m not going to tell him, his 5 he can’t watch it). SB wanders over and starts to play just to the side of MOs face. MO suddenly sits bolt upright gagging, as SB just walks out the room laughing his head off. I go over to the sofa to calm MO down and it hits me, the unmistakable smell of a SB bomb fart! That smell nearly killed me Mum! SB nearly killed me! BBG has a playpen. We put her in it; if the big kids are playing and she may get hurt due to small pieces or general rough play, of when we’re cleaning. This last week or 2 she has learnt o push her face into the side of the playpen, mesh side. Doing this means she can see around the room more and she can see us better. 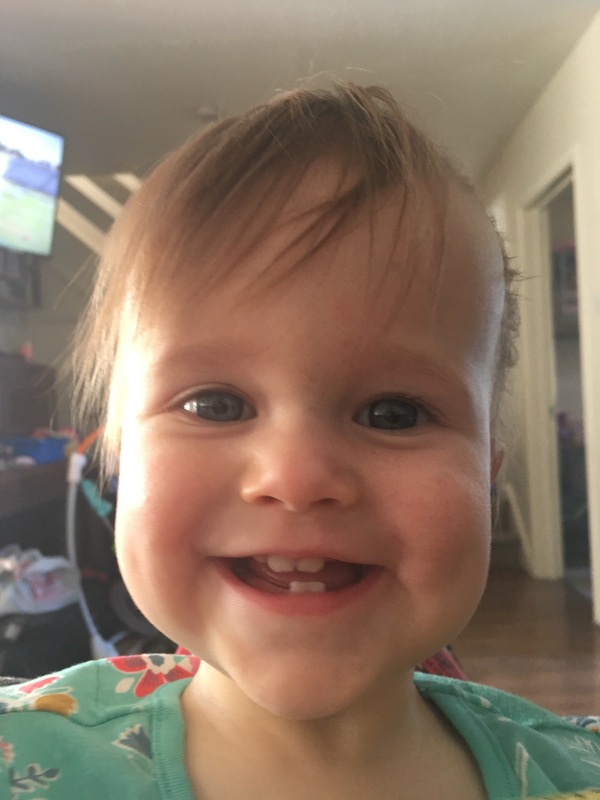 To us… all we see is a squashed nose, squashed cheeks and just a general heap of funniness as she smiles and instead of her usual beams it turns into a grimace. On a tough day this is rather funny! We are getting there now! A massive congratulations to number 2 event this week…. SB woke me up at 4.30am to watch Mickey Mouse Club House. I open my eyes to tell him to get back into bed and there he is standing there fully dressed. He usually has really good dress sense, but that morning I just couldn’t help but snort with laughing! Last night I had been looking forward to having a bath, with my last can of coke while Dad was out for the night. I run my bath, went to get my magazine and coke and put it on the landing while I tucked the kids into bed. I decided I’d read my magazine and have a sip of coke in bed. I put the fan on my bedside table. I slipped into the bath and thought nothing more of it. After my bath the can had vanished. I looked EVERYWHERE!! Could I find it? Of course not. I got into bed with my water. Much healthier but annoyed as thought I was going mad. Little pickle thought I was the lucky one. I have no words! Anyway in a poop couple of weeks where all I could see was black clouds, all I could see was the fact my son has issues and my daughter is stilll undiagnosed and still a mystery, I decided I have to see the brighter side of life. Kids are magical and brilliant at lifting your spirit no matter what. Their innocence and their antics just make you smile even in the gloomiest of days.